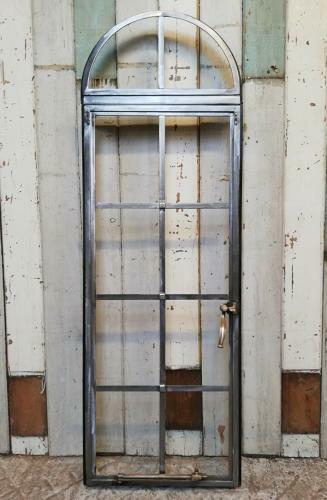 A fantastic reclaimed, industrial style, crittall window with arched top. The window has 10 panels, 2 of which are arched, ready for glazing. There is a rebated lip / edge around the window and it has brass coloured working metal handle with decorative detailing. The window could be used for its original purpose but also could be used as a stunning mirror. The front face of the window has been stripped and has a fantastic industrial look. The makers details "Hopes lock bar" are stamped into the metal. The back face is unrestored as the window can turned in to mirror, however we can strip and restore the back face for an extra charge if required, please contact us for further information and a quote. Although the item is unglazed we can quote for the window to be fitted with clear, frosted or mirror glass, please contact us for details. We can also remove the hinges on the back face for an extra charge if the window is to be turned in to a mirror. The window can then sit flush against a wall. The window is reclaimed and therefore has some character wear, adding to the industrial look of the item. There is some slight surface rust, especially to the back and the glazing panel edges, which have some roughness. Some light tarnish, scratches and marks can be seen, please see pictures for details. The arched top panel is slightly loose as one screw is missing. The window is a very attractive item and crittall is currently very popular. Ideal for an industrial or modern interior, the window is of a great quality and has a very interesting look. We have a similar unrestored window available, please contact us for details and to discuss restoration and price.